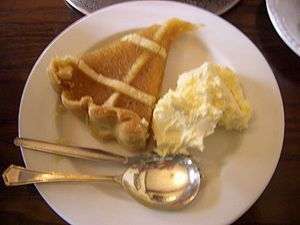 This is a list of prepared dishes characteristic of English cuisine. 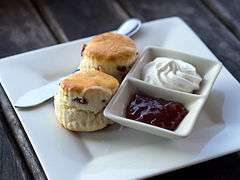 English cuisine encompasses the cooking styles, traditions and recipes associated with England. 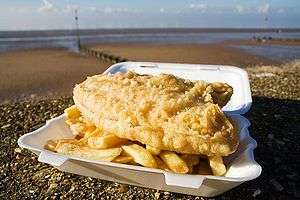 It has distinctive attributes of its own, but also shares much with wider British cuisine, partly through the importation of ingredients and ideas from North America, China, and India during the time of the British Empire and as a result of post-war immigration. 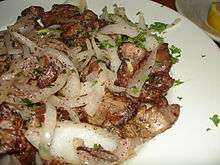 Ingredients that might be used to prepare these dishes, such as English vegetables, cuts of meat, or cheeses do not themselves form part of this list. 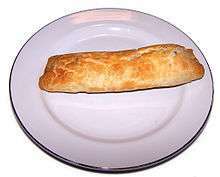 Bedfordshire clanger 1800s (century) Savoury and Sweet Bedfordshire Suet crust dumpling with a savoury filling one end, sweet filling the other. 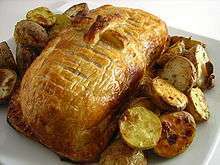 The savoury filling is usually meat with diced potatoes and vegetables. 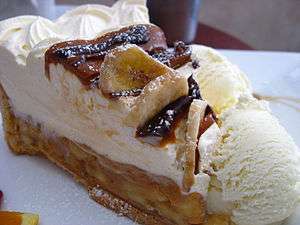 The sweet filling can be jam, cooked apple or other fruit. 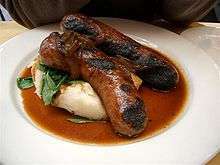 Bangers and mash 410 at latest (Roman Britain: sausages) Savoury National Mashed potatoes and sausages, sometimes served with onion gravy or fried onions. 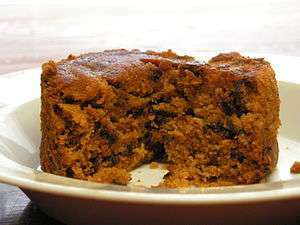 Rag pudding Savoury Lancashire (Oldham) Minced meat with onions in a suet pastry, which is then boiled or steamed. 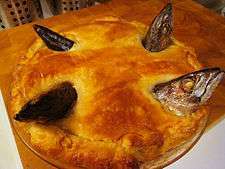 with ingredients such as ale, kidney, oysters, potato and root vegetables 1303 Savoury National Meat and gravy in a pastry shell. 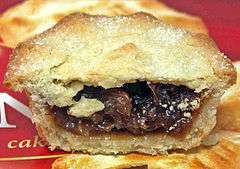 Steak and kidney pie is a national dish of the United Kingdom. 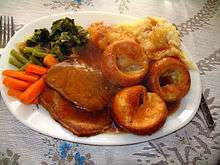 Sunday roast 1700s (century) Savoury National Roast beef 1700s, Yorkshire pudding (1747), roast potatoes, vegetables. 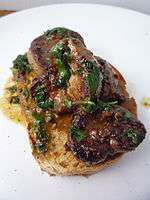 Roast beef with Yorkshire pudding is a national dish of the United Kingdom. 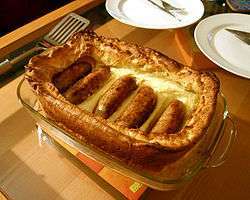 Yorkshire pudding 1747 Savoury National Souffle batter baked in very hot oven. ↑ But also traditional across Europe in both Latin and Germanic countries from Portugal in west to Lithuania in east, and from Italy in south to Sweden in north. 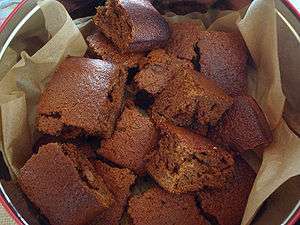 ↑ Date is for Mrs Beeton's book, but not exactly the breakfast eaten today. 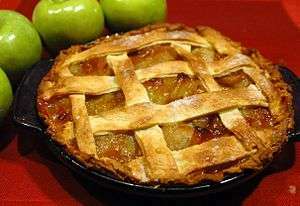 ↑ Apple pies are also found in North America, Netherlands, Germany, Scandinavia. ↑ "How do you cook a proper Bedfordshire Clanger?". Bedfordshire on Sunday. 13 April 2014. Retrieved 2 February 2016. ↑ Hickman, Martin (30 October 2006). "The secret life of the sausage: A great British institution". The Independent. Retrieved 15 April 2015. ↑ "Sausage Varieties". Northampton NN3 3AJ, United Kingdom: Sausage Links. 5 December 2013. Archived from the original on 13 January 2014. Retrieved 6 February 2014. 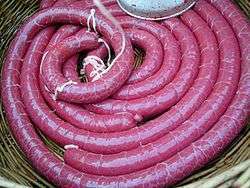 It is estimated that there are around 400 sausage varieties available in the UK. 1 2 3 4 5 6 7 Minahan, J.B. (2009). The Complete Guide to National Symbols and Emblems [2 Volumes]. ABC-CLIO. p. 563. ISBN 978-0-313-34497-8. ↑ Grove, Peter; Grove, Colleen (2008). "Is It or Isn't It? 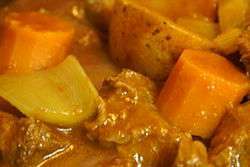 (The Chicken Tikka Masala Story)". Retrieved 16 November 2015. 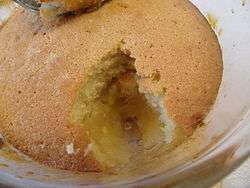 ↑ "Cobbler". ifood.tv. Retrieved 2 February 2016. ↑ Hyslop, Leah (21 August 2013). "Potted histories: Beef Wellington". The Telegraph. Retrieved 2 February 2016. ↑ Dickson Wright, Clarissa, and Scott, Johnny "Sunday Roast" Kyle Cathie Limited, 2006, p26. 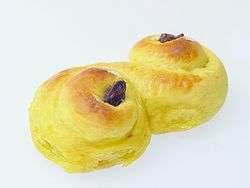 ↑ "Traditional Black Pudding". English Breakfast Society. 4 January 2014. Retrieved 2 February 2016. 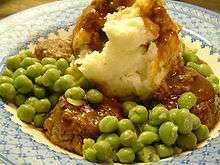 ↑ "Cottage pie". Oxford English Dictionary. Retrieved 2 February 2016. ↑ Meyer, E. (2010). 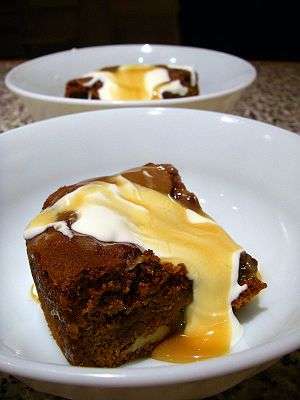 1200 Traditional English Recipes. Bod Third Party Titles. p. 112. ISBN 978-3-86195-289-3. Book first published in 1898. ↑ O'Connor, K. (2013). 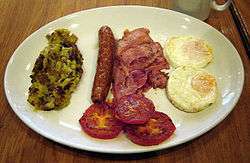 The English Breakfast: The Biography of a National Meal, with Recipes. Bloomsbury Publishing. p. 317. ISBN 978-0-85785-491-9. ↑ Oxford English Dictionary, citing Henry Mayhew. ↑ Jurafsky, D. (2014). The Language of Food: A Linguist Reads the Menu. W. W. Norton. p. pt5. ISBN 978-0-393-24587-5. ↑ Nuttall, P. Austin (1840). A classical and archæological dictionary of the manners, customs, laws, institutions, arts, etc. of the celebrated nations of antiquity, and of the middle ages. Whittaker and Co, and others. p. 555. 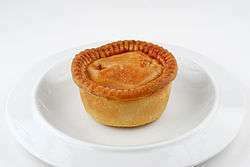 ↑ "History of Melton Mowbray Pork Pie". Melton Mowbray Pork Pie Association. Retrieved 15 April 2015. ↑ Wilson, C. Anne (June 2003). 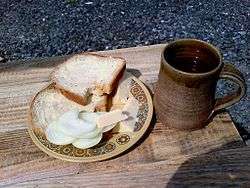 Food and Drink in Britain: From the Stone Age to the 19th Century. Academy Chicago Publishers. p. 273. ↑ Cloake, Felicity (20 July 2011). 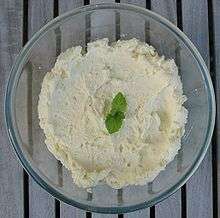 "How to cook perfect potted shrimps". The Guardian. Retrieved 2 February 2016. ↑ Cloake, Felicity (1 March 2012). 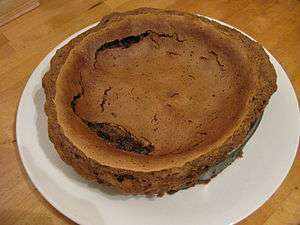 "How to cook the perfect steak and kidney pudding". The Guardian. Retrieved 16 May 2015. ↑ Lehmann, Gilly (2003). The British Housewife. Totnes: Prospect Books. pp. 83, 198–199. ↑ Kettilby, Mary (1714). A Collection of above Three Hundred Receipts in Cookery, Physick and Surgery; For the Use of all Good Wives, Tender Mothers, and Careful Nurses. Richard WIlkin. ↑ "Why do the French call the British 'the roast beefs'?". BBC. 3 April 2003. Retrieved 16 May 2015. 1 2 Glasse, Hannah (1998) . 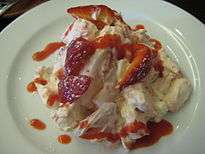 The Art of Cookery Made Plain and Easy. Applewood Books. ISBN 978-1-55709-462-9. 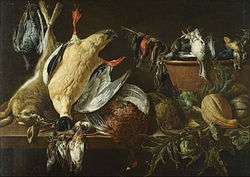 ↑ Glasse, Hannah (1747) The Art of Cookery has "pigeons in a hole". 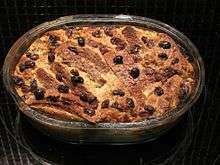 ↑ (Artusi, Pellegrino (1891) La scienza in cucina e l'arte di mangiare bene has "toad in the hole". 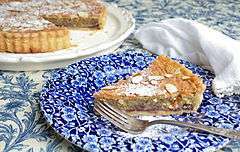 ↑ "The History of the Bakewell Pudding". 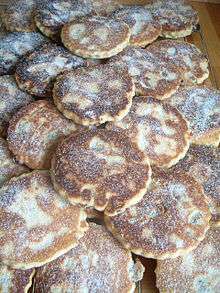 Bakewellonline.co.uk. Retrieved 1 February 2016. ↑ Davidson, Alan (2014). The Oxford Companion to Food. Oxford University Press. p. 54. ISBN 0199677336. 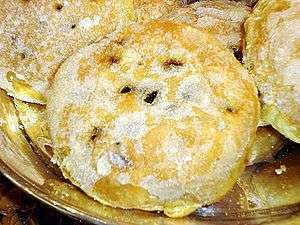 ↑ "The history behind (and recipe for) Eccles Cakes". Salford City Council. Retrieved 2007-04-10. ↑ Arthur Henry Beavan (1896). "Marlborough House and Its Occupants: Present and Past": 162. 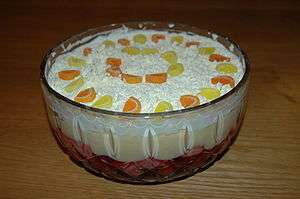 1 2 "Knickerbocker Glory". 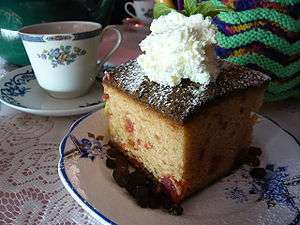 The Foods of England Project. Retrieved 18 February 2016. ↑ Ayto, John (2012). 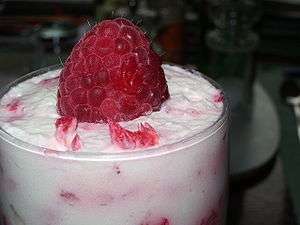 The Diner's Dictionary: Word Origins of Food and Drink. Oxford University Press. p. 349. ISBN 978-0-19-964024-9. Ayrton, Elisabeth (1974) The Cookery of England: being a collection of recipes for traditional dishes of all kinds from the fifteenth century to the present day, with notes on their social and culinary background. London: Andre Deutsch. Ayrton, Elisabeth (1980) English Provincial Cooking. London: Mitchell Beazley. 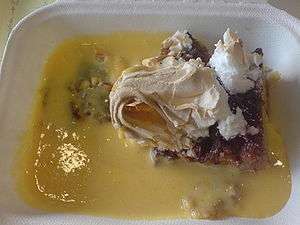 Grigson, Jane (1974) English Food. London: Macmillan. Enlarged edition 1979 (ISBN 0-333-26866-0); later editions Ebury Press with foreword by Sophie Grigson. Dickson Wright, Clarissa (2011) A History of English Food. London: Random House. ISBN 978-1-905-21185-2. Lehmann, Gilly (2003) The British Housewife. Totnes: Prospect Books. Panayi, Panikos (2010 ) Spicing Up Britain. London: Reaktion Books. ISBN 978-1-86189-658-2.